TONIGHT’S LATE LATE Show on RTÉ features multiple Oscar nominees, a three-time golfing major winner, an Olympian and some first daters. 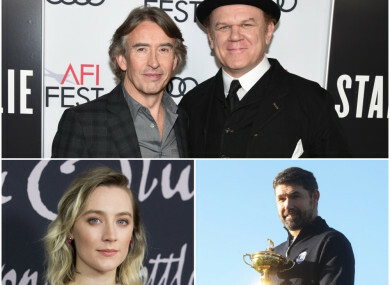 Irish actress Saoirse Ronan leads the star-studded line-up for tonight’s show, fresh from presenting an award at the Golden Globes. The 24-year-old Carlow native already has three Oscar nominations, and will be speaking to host Ryan Tubridy about her new film Mary Queen of Scots as well as taking a look back over her career to date. John C Reilly and Steve Coogan will also be on hand to chat about their new film Stan and Ollie, about the famous comedians Laurel and Hardy. Speaking to TheJournal.ie before Christmas, Reilly said he was “dead serious” about seeking Irish citizenship in the future. Tubridy will also be joined by golfing legend Padraig Harrington. The three-time major winner was unveiled as the European captain for the 2020 Ryder Cup this week, and will speak about his hopes to continue Europe’s dominance of the competition and how his recovery is going following a broken wrist in December. Four successful Irish young people will be talking about life in their twenties, with boxer Michael Conlan, actor Barry Keoghan, journalist Ellen Coyne and blogger Rosie Connolly fielding the questions. Spoken word artist Natalya O’Flaherty and podcast comedy duo The 2 Johnnies will also appear, with music from The Academic. Tonight’s Late Late will also catch up with some of the former contestants of First Dates Ireland, including Dubliner Shannon and Monaghan farmer Ciara who bonded over their love of the classic club tune Maniac 2000. Email “The line-up for tonight's Late Late Show is pretty impressive”. Feedback on “The line-up for tonight's Late Late Show is pretty impressive”.